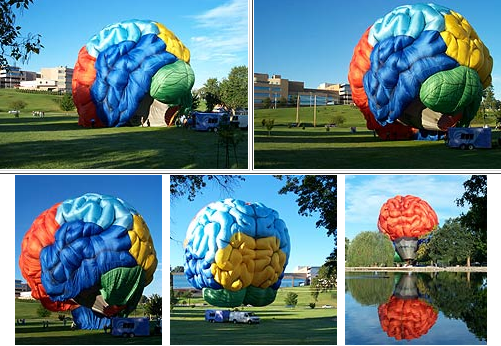 Now available from BorgCo, a huge, inflatable brain-shaped balloon, printed to look like the convolutions of the cerebrum, with EGO printed in big, black letters on the front, and a dimple moulded into the underside so that the wearer's head fits in. A chinstrap is attached to hold the assembly in place. Intended to be worn during flame wars, online shouting matches, or when trolling. The DeLuxe version has battery-powered lighting effects installed, giving the appearance of a huge, buzzing, flashing brain in rapid operation. Please check your size before ordering: S, M, L, Xl, XXL, XXXL, XXXXL and [UnaBubba]/[21Quest]. Warning: this product may cause the wearer to get stuck in doorways if used correctly. "Wow, what a super ego you've got." "Actually, it's the model above that - an ultra ego." "That's nothing, - I've got the new mega ego." Very Paris Hiltonish, but then she would be far too shy to wear it. My ego is fairly small. But it's better than everyone else's. Does anyone need that? Should we encourage huge egos? I would probably stick a pin in every one I saw. Still, It will be good to scare people, and work as a warning flag. + just because it would be funny to see people in them. //I'll take two// one for each end ? Can you send attachments that big? One hacky way is to open it from inside Photoshop manually by selecting it as Photoshop Raw (assuming that opening it directly from inside Photoshop's open dialogue box as a tiff didn't work). Then you'll need to know the X and Y pixel dimensions. And the interleave scheme, the channels, the depth and how big the tag header in the tiff was. You'll be there all day before you get something that isn't a scrambled raster of apparent grey noise. Don't waste time on a file with an invalid EOF - you'll be lucky to get it back together properly. Tiff files (tag image file format) can be in one of several interleaving schemes, such as one big RGBRGBRGB field, or planar: RRR.. GGG.. BBB.. in separate fields. In the case of the former, the misplaced EOF will cause the raster to miscount on all colour channels, in the latter, just the latter channel might be trashed. If it's compressed, then worse - very little chance I'd say. TIFF these days can use Jpeg compression (usually lossy) or LZW (always 100% lossless) and the patent has run out on LZW so there's more support for that than there ever was - it's a good compression scheme - I'd always recommend that to keep the file smaller and yet open back to the exact file you started with. Best go back to the source and get it again, in my opinion (and as a risk management choice that'll make sense later down the road). "An arbitrary but carefully chosen number (42) that further identifies the file as a TIFF file." Oh, and by the way of by the way, the Adobe DNG format (digital negative) popular in digital photography is actually an advanced highly specialised derivative (or evolution?) of TIFF. Note to purchasers: [Ian Tindale] sized inflatable egos require the recipient to have mechanical handling equipment available, due to their mass and bulk, even in the deflated state. Please ensure you have stacker truck, crane, and facilities to store a crate 3m x 3m x 3m. 2 fries, what a link. Very cool.